I sensed that the hand that planted me held great power. A deep voice pronounced a blessing then buried me deep in the earth. When spring came and the earth grew warm, I desired to sprout, but Lady Yavanna bade me be patient and wait until the right time was come. Long years I waited; the earth grew warm then cold again as year followed year and generations of Men came and went. I slept, wondering if I would ever be called upon to awaken. I sensed the world growing darker. Maybe I should wither and fall into an endless sleep? What future was there for me? To be burned like my forbear? Then Lady Yavanna called to me at last, bidding me awake and put forth roots and branches. I swiftly emerged into the light and found the world much changed. The darkness had increased and I sensed the power of evil becoming ever stronger. Yet I grew, rejoicing in what sunlight fell upon my buds and soaking up refreshing drops of rain. The soil was sparse here upon the mountaintop and I could not put forth deep roots, only cling tightly to the rocky ground. Neither did I blossom, for to me, each petal was a tear of joy and there was little joy in this dark world. Another springtime came, but the land grew ever darker. My leaves trembled as mighty armies clashed until one day a fresh wind blew from the West that brought me hope. Not long afterwards I heard the eagles bring tidings that the Dark Lord was overthrown and the King was returning. I knew then that my time was coming. I loosened my roots and waited. For the first time, I put forth a few blossoms. I knew my lord at once when he arrived. He clasped me firmly, yet so gently and I gladly yielded to his touch. With him was a white robed one, ancient of days. I knew him as one of the mighty, yet even he treated him who plucked me from the earth with reverence. I was afraid, for an uprooted tree will soon wither and die, yet somehow I knew I could trust this man. He carried me carefully down the mountain and planted me firmly in the earth beside a fair fountain. He brought water for my thirsty roots. Then he caressed my trunk and murmured, "You are a sign from the Valar. I know now that she will come." I sensed I was safe in his care. My new home could not have been more different than the old. Before I dwelt in solitude and the wild beauty of the mountainside. Now I was surrounded by Men and buildings of stone. I was never alone as stern and silent guards watched over me day and night. The garments they wore were adorned with a likeness of me, as often too were my lord's raiment. Many people came and stared at me, their eyes full of wonder. Each night my lord would visit me and talk to me. I grew to love him and I was certain that he loved me too. In my joy I put forth more and more blossoms. My lord and a younger man even visited me one night and gazed at me in wonder when the moonlight turned my white petals to shining silver. Sometimes, though, my lord turned away from me and gazed wistfully towards the North. It was not long before I discovered what he sought. When my blossoms were at their fairest, he came before me with a maiden, more beautiful than the stars themselves and a host of fair folk. The mighty one presided as my lord and the fair one joined hands and exchanged rings. I showered them with my petals to bless their union. 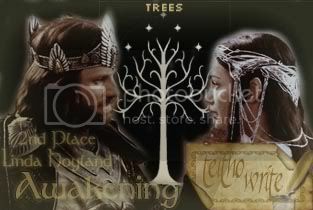 I knew then that my lord and lady would put forth deep roots and bring forth saplings of their own to play beneath my sheltering branches. A/n Written for the Teitho "Trees" challenge where it was placed second,.